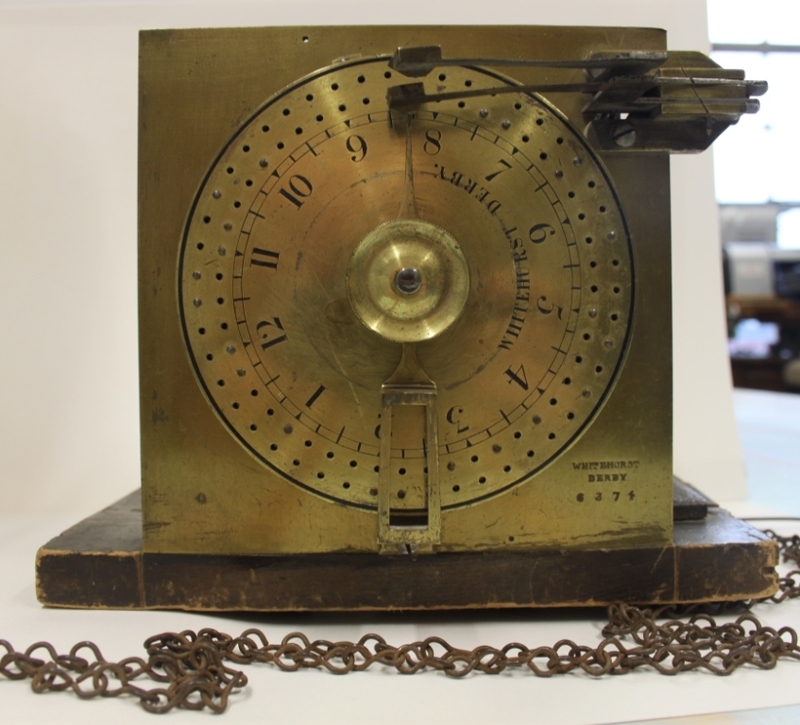 Derby Museum and Art Gallery have bought a brass and steel eight-day movement from a two-row facing pin type noctuary or watchman’s clock. A noctuary was used principally to monitor a night watchman’s rounds. The pins would be depressed every 15 minutes by the turn of a lever. John Whitehurst III was the third generation of the family to make clocks in Derby. He was born in 1788 eldest son of John Whitehurst II nephew and heir of the firm’s founder John Whitehurst FRS. He was apprenticed to his father in 1809 and was thereafter in partnership with him until his father’s death in 1834. A leading local freemason, he won the competition to make the clock for the new Palace of Westminster in 1855, but died the same year without work having started. The firm was taken over by Roskell of Liverpool and closed in 1862. In August 2010 Derby bought an angle barometer made by John Whitehurst FRS, find out more here.